Making a purchase could not be easier. Just browse our Product catalog, and click on any items that you wish to buy and put them into the shopping cart. After you have finished your selection, click on "CheckOut" and you will be asked for a few details that we need to be able to satisfy the order. Post the goods to us and we will credit you immediately or send your replacement items as soon as they are available. If an item was sent to you in error, we will reimburse all your delivery costs. If you have questions about a specific return, please send us an email. All Items must be returned in tact unopened. If a product`s packaging has been opened we will not accept a return. Choose your post code in the shipping list. A minimum of £15.00 total must be spent to allow FREE Local delivery. All Shipping to UK Mainland other than the post codes stated will be calculated on weight. UkMail charges will be applied. UkMail charges are as at 1st April 2017.
will be processed the following working day. Orders are only processed Monday through to Friday. If you would like to add a comment about your order, please write it in the notes field on the checkout page. Subject to stock availability and receipt of payment, non local orders will be processed within 2 working days and handed over to a courier company for delivery door to door. Orders received over the weekend or on a Public Holiday will be processed on the next working day. Items which we have in stock will be shipped from our fulfilment centre in Richmond via a standard ground service to arrive within 3-5 working days from receipt of payment. Should you wish to receive your item via an express service please contact us sales@ukpetscompany.com for a quote. We endeavour to have all displayed items in stock at all times, however due to circumstances beyond our control, there may be a delay in updating our website. Should an item you have ordered not be in stock, you will be contacted by our online team. Items which are not in stock may soon become available, however if you do not wish to wait we will offer you your choice of another product or a full refund. We know of no documented cases of credit card fraud using our shopping system over the Internet. All credit card numbers are encrypted in the software when the order is placed using 256 bit encryption. They are not held in clear text on any web site. Our encryption system is accepted as banking and military standard. UK Pet Centres do not disclose buyers information to third parties. Cookies are used on this shopping site, but only to keep track of the contents of your shopping cart once you have selected an item. 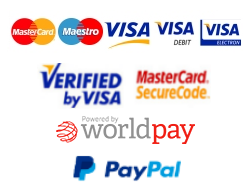 We accept Visa Mastercard Switch and most Debit cards.